Anger is a combustible emotion which leaves a trail of regret in its wake. The inappropriate expression of anger can destroy a marriage or a career. Unexpressed anger, on the other hand, leads to a different, but equally toxic, set of problems. It can fester and result in high blood pressure, depression, and feelings of helplessness. In one survey reported in the Boston Globe (7/11/04) 52% of respondents said that they “feel some of their coworkers need help managing anger.” This is a major concern for employers because workplaces with high levels of employee stress and anger increase the risk of safety, productivity, morale and customer service problems. In addition, the potential for an incident of workplace violence raises the stakes, and anxiety, for employers as they formulate their responses to angry outbursts. 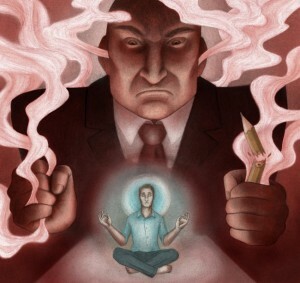 There are several approaches available for helping individuals reduce their anger including breathing and relaxation techniques, meditation exercises and distraction (the classic “count to ten”). However, in my experience, cognitive techniques offer the best opportunity for reducing anger and the intensity of outbursts. Many researchers have documented that anger control problems are frequently associated with specific “thinking errors.” Thinking errors are particularly important because anger is an emotion which is typically activated when someone thinks they have been treated unjustly. What are these “thinking errors? People with anger control problems have an insufficient supply of adaptive responses when it comes to provocative events and conflict. They have fewer ideas for alternatives to resolve situations when they think they have been treated unjustly and most of the ideas they do have tend to be hostile. People who are prone to anger often misinterpret events and take offense even when none was intended. They are hyper-vigilant and predisposed to detect evidence of people disrespecting them. People without anger control issues are able to accurately predict what might happen if they “lose it” and use this information to dampen their angry response. People with anger control issues respond without going through this anticipatory vetting process. They have difficulty accepting everyday annoyances as inevitable and taking them in stride. There is an irrational expectation that they should never have to be subjected to annoyance or frustration, and if they are, they believe in the necessity of fighting back. The good news is that cognitive-behavioral approaches can be very effective in helping individuals overcome these “thinking errors” and reduce the inevitable damage to personal and work relationships. As counselors, when we see parents ashamed of hurting their children with excessively angry responses or employees one outburst away from losing a needed job, it’s good to be able to reassure them that there are proven methods for overcoming these problems.